Soil is the great connector of lives, the source and destination of all. It is the healer and restorer and resurrector, by which disease passes into health, age into youth, death into life. Without proper care for it, we can have no community, because without proper care for it we can have no life. My collaboration with Amanda Littleton and the Cheshire County Conservation District began with a question: how does the mission of a conservation district—to improve management practices that improve soil health while increasing the viability of a farm and to educate the general public that healthy soil is the foundation for a healthy food system—connect to ideas about the natural world, public interest in working landscapes, and the cultural narratives and ideas that shape our understanding of the land? The series of events we organized successfully answered the question through community engagement with the complex relationship between natural and cultural history. A distinctive strength of this project, from a public humanities perspective, was the diversity of people who participated in the events. “The Natural and Cultural History of Soil: Cultivating Fertile Soil, Generating Resilient Communities” put books into the hands of farmers working the land, local residents working in environmental education, interested members of the community, educators, and students. In addition, our decision to make available more than one book—Dr. 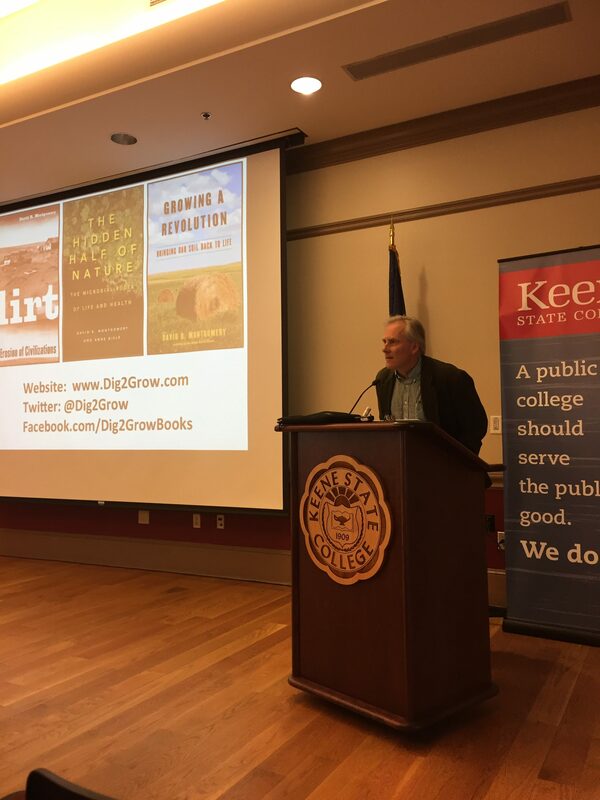 David Montgomery’s nonfiction “trilogy,” Dirt: The Erosion of Civilizations (2007), The Hidden Half of Nature: The Microbial Roots of Life and Health, with Anne Bilké (2016), and Growing a Revolution: Bringing Our Soil Back to Life (2017)—broadened our audience and enriched our discussions. The film screening and panel discussion, and the dialogues I facilitated at each of these events, were productive dialogues about the complex relationship between agricultural practices, ecological literacy, and human values. It was especially rewarding to help shape a community inquiry into the basic humanistic and ecological questions I explore with my undergraduate students every semester: Who am I? Where am I? What is going on? Our two evening conversations were characterized by frustration about the scope of the problems we face; the daunting complexity of the choices, responsibilities, and values available to us; the empowering ideas of writers and thinkers whose ideas we can think with as we wrestle with complex questions; and the existing and emerging local solutions that promote not only more sustainable agriculture and economies but also a more rewarding and meaningful life. Our panel discussion provided insights of a conservation professional, two working farmers, and an educator: Steve Pytlik, a District Conservationist working for the USDA Natural Resources Conservation Service in Walpole, NH; professor Tatiana Schreiber, who has advanced degrees in Rural Sociology and Nutrition, Mass Communications, and Environmental Studies; and Frank Hunter, who majored in Environmental Studies at Prescott College in AZ, and Kim Peavey, who studied literature and theology as a graduate student and has published over thirty articles on sustainable farming, parenting, and spirituality, who have together been raising vegetables with the help of their draft horses for over seventeen years. Following comments about the books, I facilitated a discussion using passages from the books selected by the panelists. In early November, following the film screening and the book discussion in October, the author Dr. Montgomery presented to a packed room at the NH Conservation District Annual Meeting. The following day I had the honor of introducing Dr. Montgomery to the students, faculty, and staff of Keene State College for a talk that concluded the series. In my introduction, I shared my thoughts on Dr. Montgomery’s place among scientists who have dedicated themselves to connecting different areas of scientific inquiry, developing a vocabulary to express what science tells us, and telling a story that can help us change the way we see ourselves and our world—including Rachel Carson, E.O. Wilson, Sandra Steinbgraber, and Mark Bekoff. Each of these writers, I explained, is aware that the real, material ecological crisis we face is also a cultural crisis, a crisis of representation. That is to say, I concluded, the inability of political cultures to address the environmental predicaments of our time is in part a failure of narrative. The environmental humanities begins in this idea: that we need better stories that connect us to one another and to the more-than-human world we share. Dr. Montgomery’s award-winning popular-science books, offered readers an accessible story about natural and cultural history—a chronicle that invited participants to change how they think about themselves and the world. How do historical examples of specific agricultural practices and their effects on the soil inform our current use and value of the soil? What do our current agricultural practices of agriculture say about us both individually and collectively? How do we think about soil in historical, political, historical, sociological, economic, technological, even moral terms? How do we understand the social needs and demands of our local agricultural economy, the natural constraints of ecology and the political imperatives of democracy? And how do we reconcile agricultural practices, community health and resiliency, food health and security, with our insatiable consumer economy? It was delightful to have David with us here at Keene State College and to work with Amanda Littleton to share his writing and presence with members of the Monadnock region. The adventure in the public humanities brought together farmers, members of the community, and students to think together about the world in which we live. We also developed a reading list, The Literature of Dirt, that includes other resources for a season of reading and thinking about the source and destination of all. As a professor who has worked with the New Hampshire Humanities Council since 1998, and who has facilitated dozens of book discussions at libraries around the state, I am grateful for the support of this project. My hope is that the Humanities Council will use this successful dialogue to expand the reach of the humanities through comparable collaborations with other organizations and institutions. These kinds of partnerships begin in questions about how to create dialogues across the communities that define us. We need these questions, as well as the answers they might lead us to consider. Essay “Ploughing on Regardless” (published in The Guardian 25 March 2015) centered around a question: Almost all other issues are superficial by comparison to soil loss. So why don’t we talk about it? Developed for Introduction to Soils or Soil Science courses, The Nature and Properties of Soils, Fifteenth Edition, can be used in courses such as Soil Fertility, Land Resources, Earth Science and Soil Geography. “Upon this handful of soil our survival depends. Husband it and it will grow our food, our fuel, and our shelter and surround us with beauty. Abuse it and the soil will collapse and die, taking humanity with it.